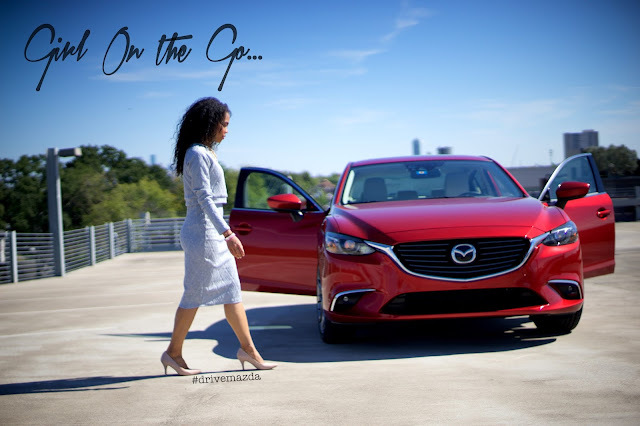 If you follow me on Twitter and Instagram you know I got the opportunity from DriveShopUSA and Mazda to test drive the 2016 Mazda 6i Grand Touring. 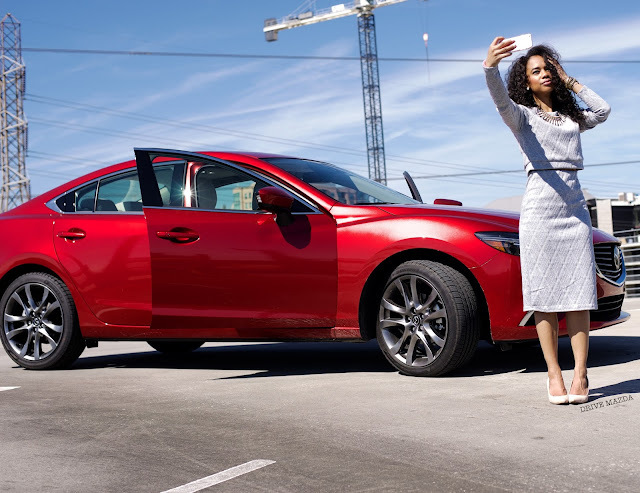 The Mazda 6 comes in three trim levels and the Grand Touring is the flagship. 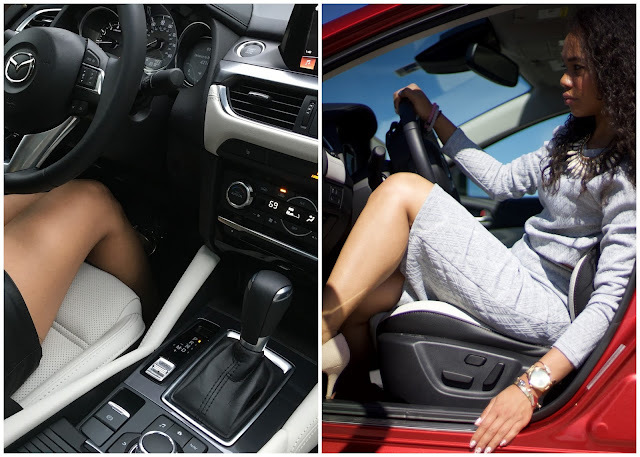 Complete with a 7inch display, heated seats, spoiler, Bose speakers, navigation and drive assist this car is the perfect stylish ride for a girl like me on the go. When it comes to the interface, its pretty user friendly. The 7 inch display can be controlled through a rotary center console to drill down submenus ( basically a knob/joystick), as well as touchscreen option on the display screen. The only ones I care about are music and navigation. The Music submenu is actually lengthy since it features almost every possible music option from AM/FM/XM (and HD versions) to stitcher, but my bluetooth is what I'm used too. Streaming Spotify was my go to option. The Navigation screen also detects speed, and turns red to let you know you are truly on the go because you are speeding, and being on time is a problem for you because you are always in a hurry. There is a unique active driving display that is basically a clear panel that pops out of the dash that projects MPH. I like it since its in your eye line while driving, it also shows some of the lane assist features. Although there is also an analog version of the MPH, I found myself only looking at the heads up display. This car seems to marry old school and new school very well by giving users traditional as well as advanced functionality. The user function options don't force the consumer to go completely enthusiast at any point. Included in the Driver Assist attributes is Smart City Breaks (which slows the vehicle when going under 18mph), Lane Departure warnings, and blind spot monitoring. If you live in Houston and have driven on 290, all of these things are super helpful. The lanes a little uneven in the construction riddled stretch of roadway, so the lane assist can be kind of annoying but you can turn it off. 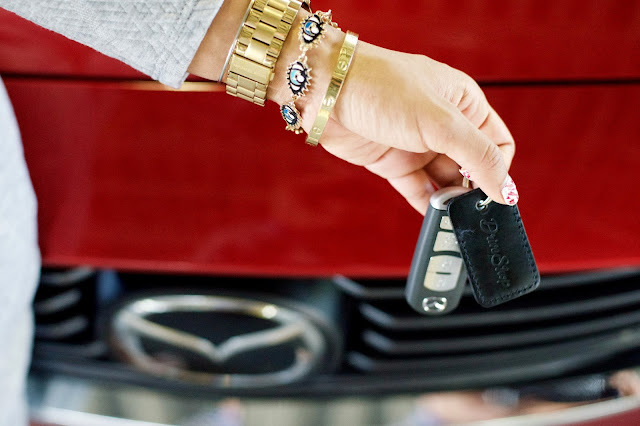 This surprised me, but the Mazda is actually a 4 cylinder model vehicle. It boasts 32MPG EPA combined but it looks like my car averaged 26. It has also been driven less than 2k miles so that might be part of why the average is a little off. The four cylinder is rather quick and smooth. I am used to driving a fairly new 2.5 4 cylinder vehicle, and it's pick up is a little slower than the Mazda 6. This Mazda is a little more stiff due to the 19in wheels. Aren't they pretty though? Sporty chic! Other wins include heated seats and a sunroof. With how bi-polar Houston weather is, I got a chance to use both. I even drove this car in part of Hurricane Patricia's aftermath, so I can honestly say the safety features are serious. 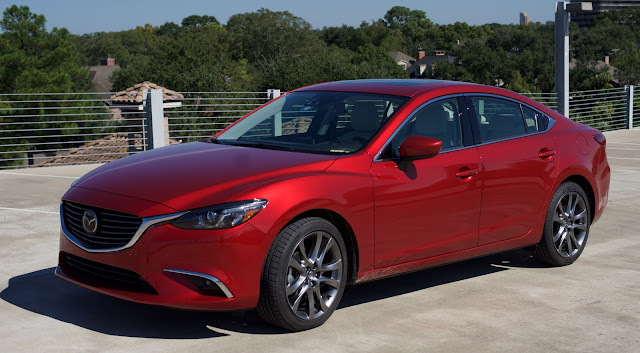 The sticker price on this car was just over $33,000, but the Mazda 6 starts around $21,000. Its been a fun week running the town in this Mazda. 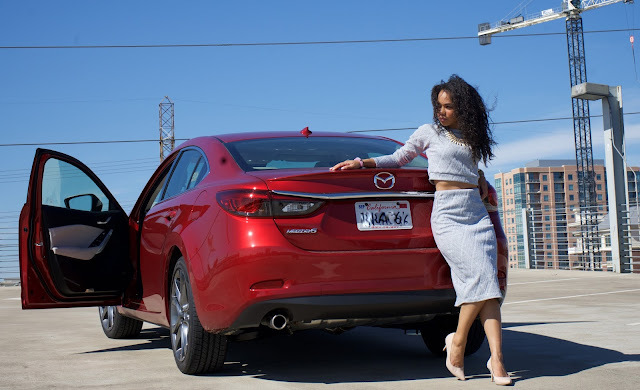 This post was sponsored by MazdaUSA and DriveShopUSA. The vehicle was driven for testing and evaluation purposes over a period of time. Thank you for your support in supporting my sponsors! Without them this blog is not possible :) As usual, all opinions are my own.